A thought-provoking post. We can't be passionately interested in everything we own or do. Selective interest is essential. I can certainly relate. A side hobby of mine is repairing Elgin pocket watches, and when I first started I quickly realized how many small variations there were, so many that I couldnt be bothered to keep track. Dealing with the watch equivalent of twdb, i found that they threw the same movements into countless case styles, and vice versa, with each specific type of watch only having a production count of a few thousand before they changed it up again. Insanity I tell you. It appears many of us have multiple collections. Slide rules are also that way, only a few had serial numbers, so often dates are a challenge. I do like the old watches. 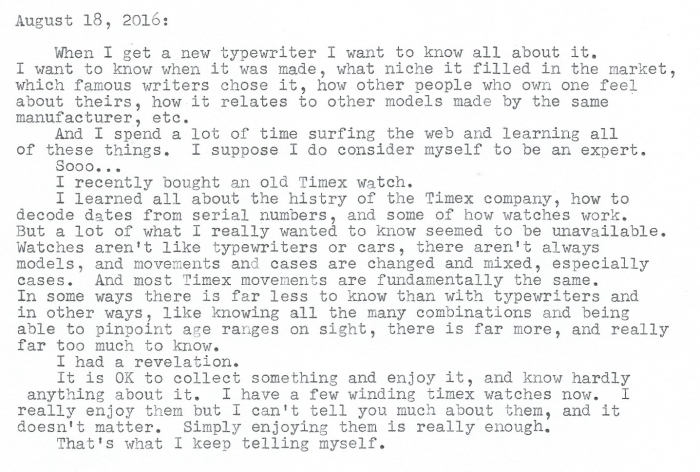 I have a Timex Electric Dynabeat that I like. My "enjoy but don't dive in too deep" is the zoo, and shows about wild animals. It's fun for me to watch those, or to go to the zoo and not have to know every last thing. Keep an eye out for me doing street poetry! Either under "Word on the Street" or "WithInk"